Jan-Heie Erchinger, the older of two sons born to a pastor and a teacher, grew up in Hanover and Braunschweig. From a young age, both brothers had a passion for music and began to play the piano (Jan-Heie) and drums (Dirk). Jan-Heie Erchinger took jazz piano lessons from Otto Wolters. 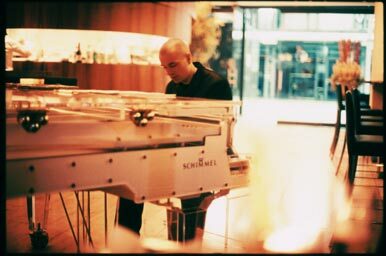 After receiving his university-entrance diploma from the Neuen Oberschule, Jan-Heie attended the Yamaha Music Station professional course for two years from 1989 and graduated from the Hamburg University for Music and Theatre in 1991, majoring in Pop music. Erchinger also studied music in Braunschweig with Prof. Rainer Schmidt and Dr. Rainer Wilke and graduated in 1995. At the same time, Erchinger’s music career was launched in 1992 when his number with the Blue Knights (under the pseudonym: ‚Jay Heye‘) duo reached the US Billboard Top 10 NAC Jazz charts. In 1994, Erchinger was a founding member of the Jazzkantine, with whom he recorded eight albums as well as a live DVD and played in more than 1000 performances. Jan-Heie Erchinger is a full member of GEMA and a member of the German Musicians Association (Deutscher Tonkünstlerverband). In 2008, he founded the music school, Music Trainer Erchinger, based in Cremlingen and Braunschweig. His children’s musical, Kampf um Nussland , premiered in 2009. In 2010, he played a pianist in „I Hired A Contract Killer“ by Aki Kaurisk√§ki in the Staatstheater Braunschweig. In each case, since their founding, Erchinger has been a regular player in Jazzkantine, D-Phunks, Blue Knights, Juju Orchestra and Bahama Soul Club. In addition to his own music, he also produces audio books and music for advertising campaigns. Jan-Heie Erchinger plays the piano and as a Jazz/Funk keyboardist he plays on mainly originals from the 70s, such as the Fender Rhodes E-Piano, Hohner D6 Clavinet, Yamaha CP-70 and the Moog Prodigy. In mid-2010, Jan-Heie Erchinger left Bahama Soul Club and Jazzkantine to devote himself to his own independent projects. He is currently working on his fourth solo album and is planning appearances with his own band, as well as various guest musicians. Together with Jazzkantine he received the most distinguished German awards, the „Echo“ and the „Jazz-Echo“. Jan-Heie has already had a number of songs enter the charts. He is credited with placements such as a Top 10 hit in the US Billboard NAC charts with Blue Knights, several chart placements in the German Top 100 with Jazzkantine, a number one hit in the German dance charts with Juju Orchestra and a top 3 placement with Bahama Soul Club in the iTunes Jazz charts.